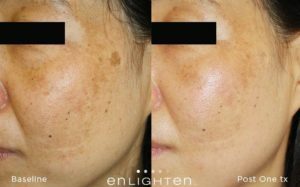 Pigmented lesions, such as freckles, sunspots, and certain types of brown birthmarks can be treated with a variety of pigment-specific lasers and light-based devices. The same lasers that are used to lighten unwanted tattoos can help lighten pigmented lesions. Since freckles and sunspots may be seen with fine lines and wrinkles, pigment-specific laser treatments can be performed at the same time as other treatments available to improve the look of sun damaged skin. However, it is important to evaluate the skin before treatment and accurately diagnose the specific brown spot, whether it is a freckle, sunspot, or mole. 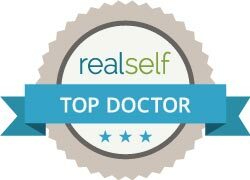 Board-certified dermatologist, Dr. Jessica Kim will thoroughly evaluate your pigmented spots to determine the appropriate treatment. Once sunspots are lightened, the skin looks more radiant, even-toned, youthful, and vibrant. Depending on severity and type of pigmented lesion, Dr. Kim will determine the best device to use. These devices would include Intense Pulsed Light (IPL), Excel V 532 nm, or Enlighten picosecond laser. Treatment of pigmented spots usually takes just a few minutes to perform. Most patients feel a light, snapping sensation during treatment. After treatment, the spots are red and resemble bug bites for 1-2 days and then darken and flake off between 3-5 days. Although good improvement is expected after a single treatment, many patients will require more than one treatment for the best results. It is important to protect the skin afterwards with a broad-spectrum sunscreen of at least SPF30 and minimize sun exposure to maintain the best results.